I was very impressed with the food scene in San Francisco and had some pretty fantastic meals over my short trip. I made sure to do my homework in advance and made a few reservations at those hard to snag tables (noted below). 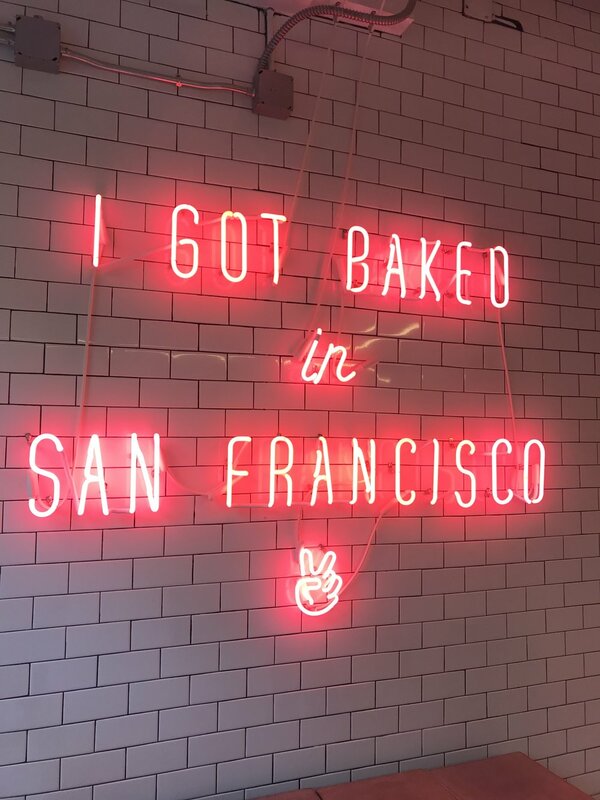 Since I was mainly in San Francisco for work, attending a UCSF Conference on Medical Education, I really only had the evenings to explore and go out to eat (although I managed to sneak in a few bakery treats too). Every night I looked forward to meeting up with friends and trying out a fun, fab SF restaurant. I was so happy with my dining choices, so I’m breaking them down for you here! When we first flew into San Francisco, before heading up north to Marin County for a dreamy airbnb experience (blog post coming soon), we needed a quick lunch and to stock up on some groceries for our “remote” cabin meals. Bi-Rite Market was the perfect stop with giant, yummy sandwiches and prepared foods as well as awesome organic produce and gourmet goods. They even had a vegan sandwich for my boo. The goods here are pricey, but we were so happy with the quality and only needed a few select items for breakfasts and simple dinners for the weekend. We also found out they have a creamery down the street and on this particularly warm February day, we saw many happy patrons devouring their ice cream cones as they strolled by the shop. We opted out of the ice cream that day in favor of a quick jaunt around the corner to Tartine Bakery. So famous we had to check it out. We picked up a giant thin chocolate chip cookie and an almost equally giant pan au chocolat. The croissant was flaky and buttery with a good ratio of chocolate. After we devoured it we wished we had warmed it slightly for that perfect fresh out of the oven feel. The cookie was a bit crispy/hard, but had a great burnt brown sugar taste that I like. I would also be remiss not to mention the delicious Mr. Holmes Bakehouse which was fortuitously positioned around the corner from our hotel. With a quintessential neon sign and instagram-worthy treats, this place is just too cute. On our way back from Marin, we met up with my cousin for brunch/lunch at the SF classic, Zuni Cafe. The menu alone blew me away with interesting, unique ingredients in every dish. Think squash blossoms on pizza, persimmon salads, and wild nettle risotto. The must-have dishes here are the Caesar Salad and the Brick Oven Chicken. We passed on the chicken with two vegetarians at the table, but as a Caesar afficionado, this was something I couldn’t pass up. The crisp romaine leaves are served whole, well-dressed, and with plenty of parm and garlicky croutons. It was a well-executed classic IMHO. For dinner on our first real night in SF, we met up with old friends at Nopalito for some vibrant Mexican eats. I was intrigued by their extensive mezcal selection, but opted out since I had to be in top performance for the first day of the conference. Instead I enjoyed a subtle hibiscus-orange agua fresca which was refreshing and not too sweet at all. The group shared the totopos con chile (which came highly recommended by many trusted friends); the chile is totally manageable and these make for a great starter. Then came the quesadilla de repollitos with sweet yummy brussels sprouts and a mix of cheeses. The ceviche verde was simple and clean, but many felt was lacking in a flavorful punch. The tacos dorados de camote came as a couple crisp, sweet, savory taquitos that I wished I had about a million more of. You could taste the thoughtfully fresh organic ingredients in each dish. The servers were friendly and fun. I would definitely come back to try more of this menu. On night number two we headed to the much anticipated Liholiho Yacht Club. I recommend making a reservation for this one way in advance as it is definitely a hot spot. The only res I was able to get on a Monday night was for 2 people at 845pm and this was weeks in advance. We still wanted to meet up with some friends from college who are locals and familiar with the spot. They recommended we rendezvous prior to our reservation for drinks and bites at their downstairs spot Louie’s Gen Gen Room. The drinks and small bites we had down there were maybe my favorite part of the evening. A delicious ahi poke bowl, pigs in a blanket made with SPAM!, and potato chips with smoked trout caviar! I was IN HEAVEN!!! We tried to hold back slightly on these small bites to make room for the yummy, special dishes that awaited us upstairs. First off, their menu has popcorn on it, so immediately they’ve won my heart. The popcorn is an umami bomb, coated with butter and a Japanese seasoning blend that was seaweed forward with a hint of spice. Next we had the honey, miso glazed avocado which was a sweet, creamy delicious avo half surrounded by some yummy, fruity salad bits. Wanting to keep it light, but also curious to try more dishes, we ordered another salad made with Japanese sweet potatoes, red endive, black truffle, and blue cheese. TBH, this is one dish I had trouble understanding in terms of flavor combinations and it didn’t really work for me. What I wished I had tried was the kimchi fried rice with spam, fried oyster, whole roasted cauliflower with bone marrow hollandaise, and basically everything else on this powerhouse menu. Liholiho was lit and you gotta try it. Saving the best for last, I met up with a high-school friend and fellow foodie at Rintaro, a Japanese Izakaya visited by Samin Nosrat over her recent trip to SF. I saw her post an instagram story of her meal here and knew I couldn’t miss it. Snagging a reservation here in advance wasn’t too difficult and when we arrived it was lively and crowded. Reading up on Rintaro, I discovered that everything from the chef, to the space, to the food is a story of east meets west. Chef Sylvan Mishima Brackett was born in Kyoto and raised in California, the architectural details of Rintaro echo the traditional Izakaya’s of Japan but are built using cedar and redwoods from the nearby forests, and the food celebrates local California ingredients in traditional and some not-so-traditional dishes. I came for the Chiizu Tori Katsu. It’s a play on the traditional katsu dishes of Japan but filled with a creamy, delicious local cheese! The yakitori here is perfection, diligently grilled over two different types of coal imbuing a deep, homey, smokey char into every bite. The Kama Tama Udon is Rintaro’s version of “pasta carbonara” and is a creamy, buttery, deliciously chewy dish. I loved everything down to my cute little Japanese beer with a cat on it. The attention to detail and craft that can be seen all around and in every dish really makes this place feel special. If you’re planning a trip to SF, these are some GOOD EATS!